Located in Las Vegas, the Hand Center of Nevada (HCON) offers a comprehensive array of advanced, minimally invasive orthopaedic treatment options for the upper extremity. Practice founders George Gluck, MD and James Vahey, MD recently partnered with Rosemont Media’s skilled team to update the practice website. The improved site reflects the modern, patient-focused philosophy of the office. Easily navigable and engaging, the updated features include responsive capabilities, original content, and an aesthetically pleasing layout, all of which make finding medical information convenient from nearly any location. Visitors to the upgraded website will be greeted by a soothing and professional color palette of grays and blues. The homepage presents an educational “Where Is Your Pain?” feature that details some of the common concerns that can affect the hands, wrists, elbows, and shoulders. Current and prospective patients can also utilize the interactive map situated near the bottom to locate the practice and generate turn-by-turn directions. Helpful elements like these are hallmarks of the HCON and are designed to correspond to the accommodating in-office experience. The responsive website design will be particularly attractive to users seeking information on-the-go. The site automatically adjusts to conform to the screen dimensions of virtually any Internet-compatible device. The Las Vegas orthopaedic surgeons also equipped the site with the latest medical SEO strategies to ensure the site remains highly visible in its online marketplace. As a result, patients can promptly source desired information when an injury or condition arises. 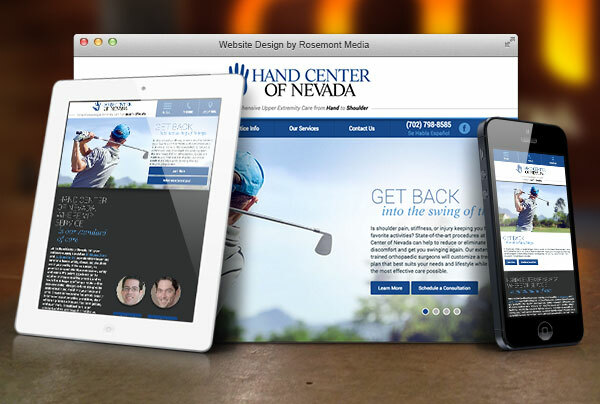 Would you like to see an example of Rosemont Media’s customized responsive website designs? Please visit handtoshoudlersurgery.com or view our expansive portfolio.